Eye in the Sky starring Helen Mirren, Alan Rickman, and Aaron Paul. To strike or not to strike, that is the big question. 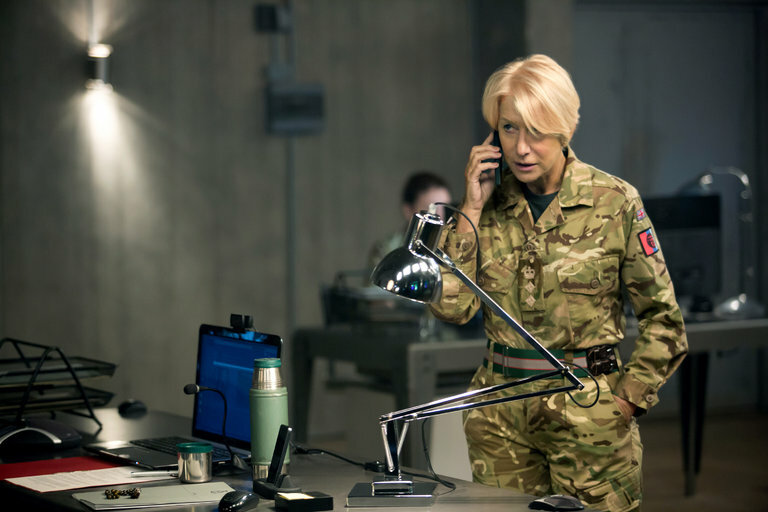 Eye in the Sky is a thriller that puts both the characters and the audience in an uncomfortable position regarding a seemingly simple drone strike. A group of well-known terrorists are meeting in a house in an inaccessible area and are gearing up for an activity that involves a couple suicide vests, the answer here is easy – take them out. The colonel in charge of setting up the mission in the friendly country of Kenya (Helen Mirren) has been tracking a British born terrorist for years and finally has the ability to take her out, along with a group of other terrorists, including a new American recruit. When the mission takes an unexpected turn from “capture” to “kill”, things get a little more complicated when a young girl wanders into the kill zone. The film shows the various government officials and their advisers (Alan Rickman, Iain Glen), the drone pilot (Aaron Paul), and the local ground team (Barkhad Abdi) struggling with the decision to risk the little girl’s life for the greater good. For the American government and the British colonel, the presence of the little girl does not change anything; the suicide bombers are likely going to endanger or kill a much larger population in the very near future, so it is best to fire the missile and contain the situation. The others are more worried about the moral and political consequences of murdering a little girl in a friendly country. Eye in the Sky works you into a panic because time is constantly running out, the decision has to be made; the trouble is, no one wants to be the one to make the decision. It is undoubtedly a dark subject, but echoes of Kubrick’s satirical Dr. Strangelove or: How I Learned to Stop Worrying and Love the Bomb work their way in as frustrations and the passing of the buck border on ridiculous. It is a nail-biting, frustrating, and darkly amusing film that most people would enjoy, as long as they are prepared to feel drained and little guilty afterwards. Helen Mirren and Alan Rickman (in his final performance before his death) are the veterans, their characters know what needs to be done and they struggle to stress the need for urgency. Their combined talent as actors help to convey the utter preposterousness of the situation, which often results in a few snickers from the audience. Aaron Paul delivers a great performance as the drone pilot faced with potentially killing an innocent bystander, and ultimately the one who will have to live with the blood on his hands – even though he is safe in Las Vegas, thousands of miles away from the target. Eye in the Sky is Barkhad Abdi’s first movie after his oscar-nominated performance in Captain Phillips and he nails the small-but-important role as the critical man on the ground in Nairobi. It is a pretty tense 102 minutes and Eye in the Sky takes advantage of every one of them. It is ultimately the perfect length for a movie like this and Gavin Hood (Tsotsi) should be applauded for smoothly showing the story from multiple points of view. You will not leave satisfied with the end result, but that is the whole point. Eye in the Sky should spark a much bigger discussion: What would you do? Drone strikes are certainly the future of modern warfare and have already been used successfully (and unsuccessfully) overseas. There’s always the debate of the ethicality of being able to wage war from the comfort and darkness of our military bases and boardrooms, and killing multiple people by the push of a button thousands of miles away. Light and reality are conveniently always on the other side of the door. In the end, Eye in the Sky makes this connection with precision. Eye in the Sky was released in theatres April 1, 2016 and showtimes can still be found in a select few theatres in many cities.